NEW YORK — Gap Inc. offered a downbeat outlook for its annual profit on Thursday after reporting a 43 percent drop in net income for the second quarter, weighed down by moves to close stores. The San Francisco, California-based company, which operates stores mainly under its namesake brand as well as Banana Republic and Old Navy, is facing the same problems as other fashion retailers as shoppers buy less clothing in general and shop more at off-price chains when they do. That has resulted in sluggish traffic at the stores. But it's also long been struggling with its own problems, mired in a sales slump as its clothes don't stand out in an overcrowded landscape. Gap has been in a cycle of discounting its goods to get shoppers to buy. CEO Art Peck, who took the helm in 2015, had promised investors that business would turn around this past spring but that failed to materialize. Peck said in a statement Thursday that during the quarter the company took "critical steps" on its restructuring plans and on building a brand with more growth potential. "While I remain unsatisfied with the pace of improvement across the business, I am encouraged by the underlying signs of progress," he said, citing healthier merchandise margins. Peck told investors on a conference call that the company is pushing more high-tech fabrics like stain-resistant clothes and adding more stretch in men's clothing as he sees shoppers are willing to pay more for the extra feature. The company is also testing smaller-sized Old Navy stores. And it's pushing athletic-inspired clothing at Gap and Old Navy stores. The company has done well with it Athleta stores, which focus on active wear. It's also working hard to improve fit — a problem that has long bedeviled the retailer. Given the environment, Gap said it expects annual earnings per share to be from $1.87 to $1.92. Analysts had expected $1.95. 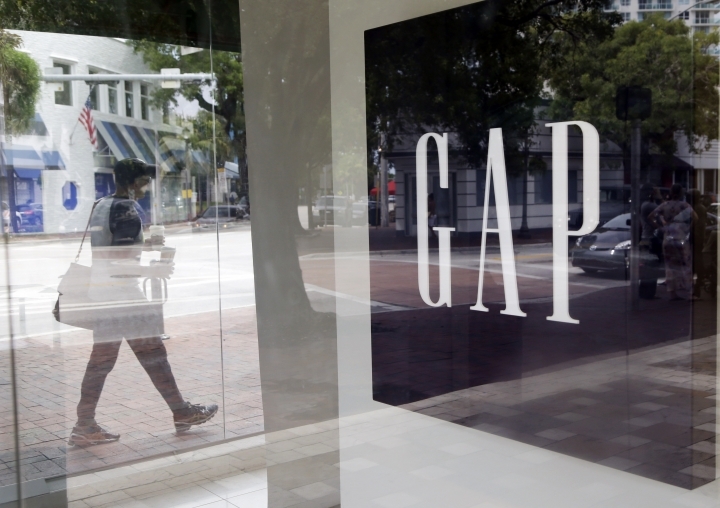 Gap's stock slipped 1.6 percent to $25.45 in after-market trading Thursday. During regular trading, shares had edged up 1.6 percent, or 42 cents, to $25.88. The company said net income came to $125 million, or 31 cents per share, in the quarter ended July 30. That compares with $219 million, or 52 cents per share, a year earlier. Adjusted results were 60 cents per share, a penny above the estimate by FactSet. Revenue slipped 1.2 percent to $3.85 billion. Gap announced earlier this month that for the second quarter, it saw a 2 percent drop in sales at stores open at least a year. By division, Gap stores suffered a 3 percent decline in revenue, but Banana Republic has been more problematic, seeing a 9 percent drop in the quarter. Lower-priced Old Navy was flat. Under former CEO Stefan Larsson, Old Navy had a streak of sales growth from 2012 to 2015. But after he left to lead Ralph Lauren Corp., the brand's sales stalled this year. In April, Old Navy named Sonia Syngal as global president of the division. She had been an executive vice president in charge of the company's supply chain. As for fit, Peck told analysts the company has "done too much wandering around the landscape for the last couple of years." He added that fit problems have been an "economic drag" on the company, particularly online. That's because the company has to deal with the cost of returns as customers order different sizes. Earlier this year, Peck bemoaned to investors that Banana Republic made a blazer with arm holes too small for an average customer to put her arm through. But Peck said that the company is making strides in fit. Gap announced in May it was shuttering 75 Old Navy and Banana Republic stores outside North America as it looks to focus on regions where it sees it has the greatest potential for success. The move affects just a fraction of the more than 3,700 stores Gap operates globally and should save the company about $275 million a year before taxes. Still, some analysts are not convinced that a turnaround is near for any of the three major brands. "The Gap brand has no sense of newness and heavy discounting and constant promotion still appear to be the only tools the company has to drive trade," said Neil Saunders, CEO of research firm Conlumino. "From our own data, it is clear that in the U.S., Gap is not only losing customers, but the customers it does have are both visiting less and spending less when they do visit." Saunders described Banana Republic as a brand that has "simply lost its way" and is falling into the same trap as Gap as it resorts to discounting. Old Navy is in a better position, he says, but the marketing and merchandising has been inconsistent.